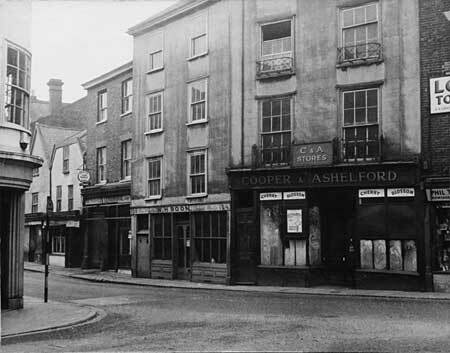 The shops between the Kings Arms (The Kings) and the corner of Okehampton Street in Cowick Street were in a bad condition by the 1950's. 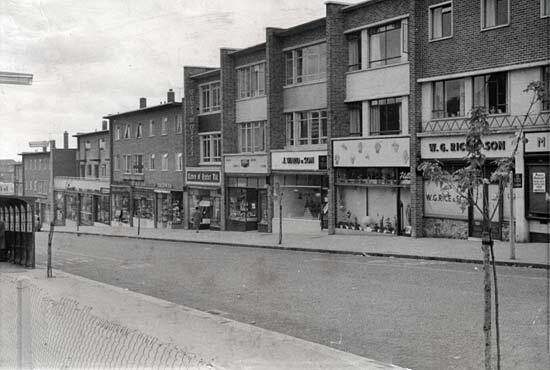 The photo on the top left, shows the shops at the junction of Alphington Street and Cowick Street. They were demolished and the road widened, as shown in the photo on the bottom left. Photos courtesy Exeter Parks Department. 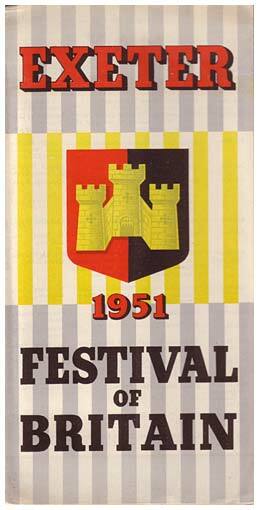 Exeter had a full programme of events during the Festival of Britain in 1951. Rebuilding the war damage had started, and there was sense of better things to come. Events listed included: Seven-a-side rugby, Exhibitions of paintings by Francis Hayman, Francis Towne and John White Abbot, Model Yacht Racing at the Double Locks, Fireworks, an Air Display and more. Exeter's first female police constable - Phyllis Wooldridge was the city police force's first female PC, when she joined the force in 1949, with the number PW1. 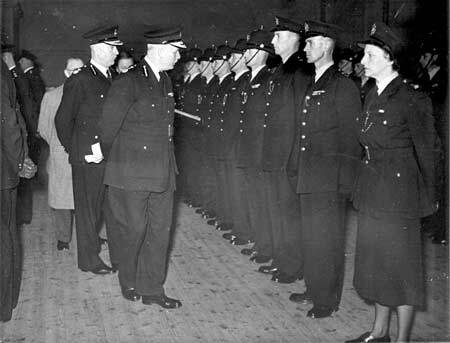 Here she is pictured at the front of a line of police officers on parade in the old bacon factory, in Waterbeer Street. They are undergoing the annual inspection by HMI Ian St Johnstone in 1954. 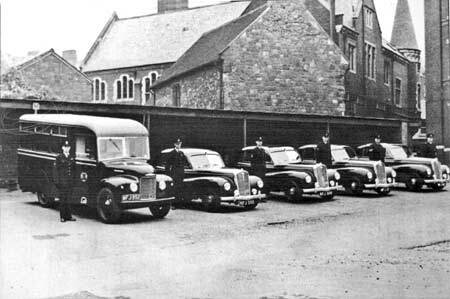 Police cars - also from 1954, these four Wolseley 6/80 police cars and Commer Black Maria are parked up behind St Pancras Church in Pancras Lane in front of a lean too garage known as the 'Linney'. The valve radios in the cars would drain the battery in a short time, requiring the vehicle to be attached to a charger when parked up in the Linney. The corner tower of Exeter's police station, in Waterbeer Street, is on the right of the photo. The police officers from the left are: Eric Rainsbury, Tom Allder, Les Bartlett, Jack Tarr, Sgt Bishop and Inspector Lightfoot. 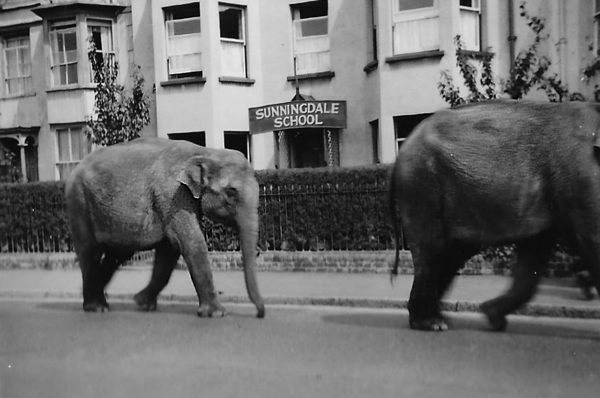 Elephants often walked from a station to a circus ground in the 1950s and 60s. The photo far left shows them walking past the Sunningdale School, now long closed. Martin Roberts, who provided the photos wrote "We reckon that I took the photos in approximately the early 1950s. I had overtaken the animals on my way home (by bike or bus) and I raced home as fast as I could, grabbed the family camera (a pre-War folding Ensign Selfix), and ran back to the top of the road in the hope of being in time to see them pass. We presumed that they had probably arrived in Exeter by goods train and were being walked from either St David’s Station or Central Station to wherever the circus was setting up. 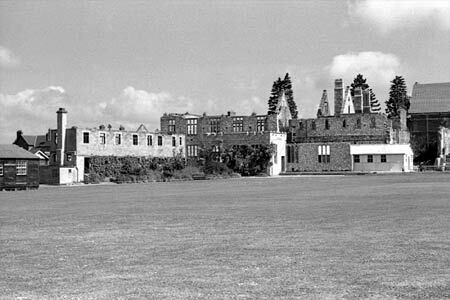 Might this have been the King George VI playing field at Countess Wear, perhaps?". 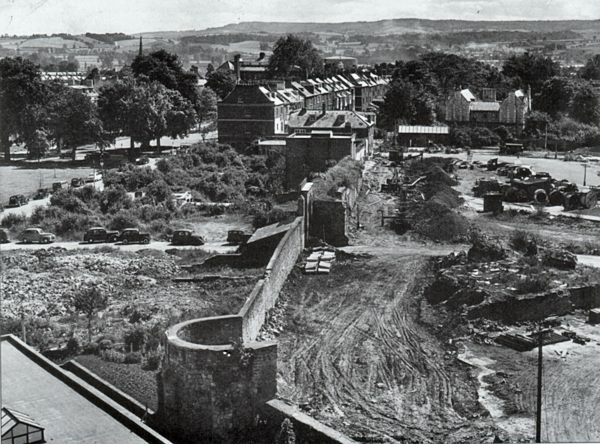 This photo from 1951 shows, to the left of the city wall, the ground that is now the site of Broadgate House. The land to the right is Princesshay. It is difficult to imagine the devastation that hit Exeter in the blitz, and it took many years for all the bombed wasteland to be developed. The Broadgate House land became a car park for many years, before Broadwalk House was constructed in the 1970s.Princesshay was built over a time span of about ten years, during the 1950s, and then it was torn down in 2004, and the new, shiny Princesshay that we all know was constructed. The Congregational Church was destroyed during the 1942 blitz, leaving only the original tower from the 1868 construction. 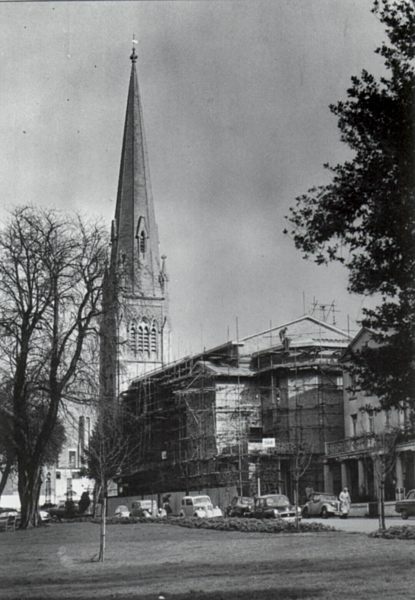 This photo shows the scaffolding around the new building in 1957. Alphington Street is probably one of the least photographed main streets in Exeter, for some reason. 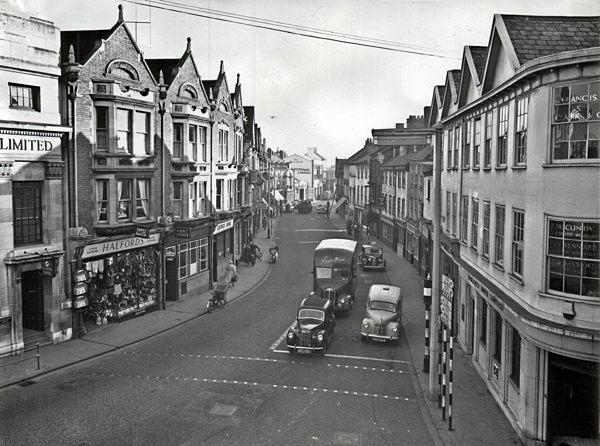 This view from the 1950s shows both sides, from the corner with Cowick Street. The street curved to the right, at the end, in the photo, before passing under the railway by Willeys Avenue. 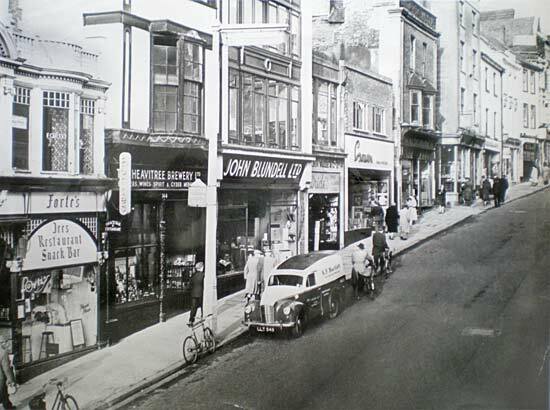 Fore Street after 1957 when the Forte's Cafe was opened. The van is an Austin of Bartlett Refrigeration. The Wheatons shop had a large printing works at the rear which stretched to Bartholomew Street. In the 19th Century, Thomas Latimer's Western Times was printed there. The site is now Homecourt House, retirement flats for the elderly. A view across Cathedral Yard towards the High Street. 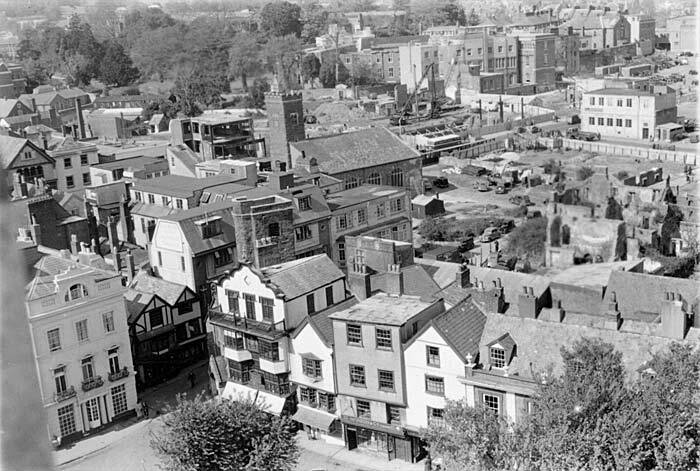 Taken from the North Tower of the Cathedral by Henry Holladay, it clearly shows the early stages of rebuilding the High Street, especially the north side with Commercial Union House. It was the first block of buildings to be constructed and was finished in 1952. 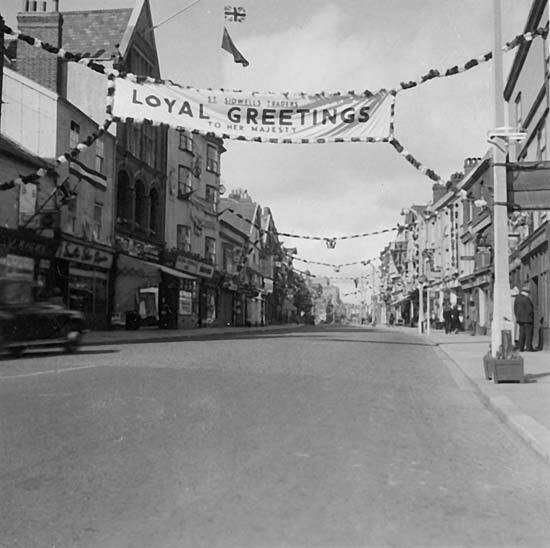 Even the shopping streets put out the bunting and banners for the Coronation of Queen Elizabeth II in June 1953. This photo, supplied by Richard Holladay shows a large banner in a deserted Sidwell Street. It was taken by his father Henry Holladay. 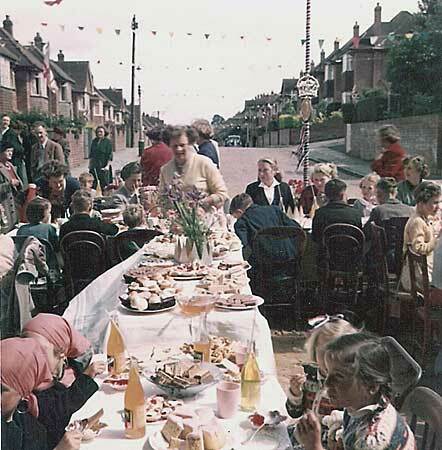 A nice colour photo of a street celebration for the Coronation, on 2 June 1953. The children of Cowick Hill are enjoying a spread fit for a Queen. After the rationing of the war years, this was true profligacy, and yet, compared with today, it was a very simple and modest affair. The two girls in the foreground on the right of the table are Susan and Gillian Pile the two older girls on each side of the post, with a crown, are Pamela Cowell and Sheila Scriven. Photo supplied by Penny Jarritt who is the little girl with a pill box hat to the left of the central lady. Penny was born in the city and attended St Wilfrid's School. 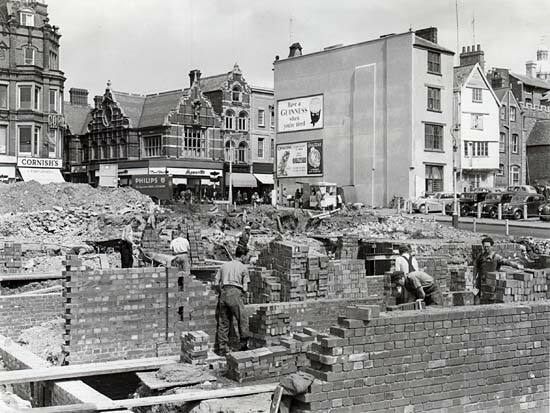 Rebuilding South Street did not start until 1955 when work commenced on the west side – photo right courtesy Express & Echo. 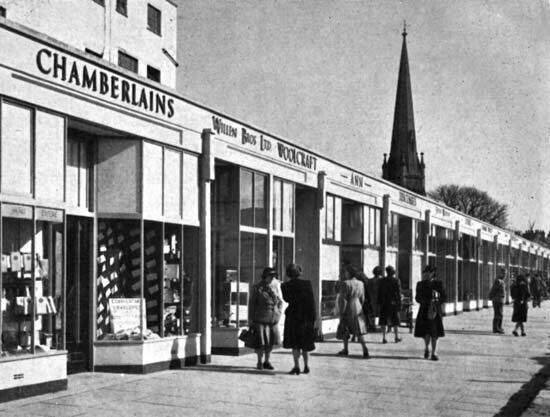 By 1956, these shops were finished and occupied – photo left courtesy of Trevor Brown. The wire fence in the left foreground indicates that the east side is still in construction. In 1947/8, before the rebuilding of the city started, temporary shops were installed at the old Lower Market, Fore Street, Paris Street and these at Eastgate. The building in the rear is the pre-war Co-op which survived the blitz due to its then modern design. It was later extended to become Eastgate House which was demolished and replaced by the Next building in the mid 2000s. Photo courtesy City Council. 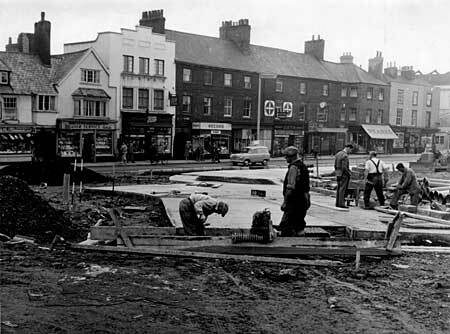 "On Saturday 5th October 1957, Boots new premises were in the final stages of shop fitting and the area of the pavement out side underneath the concrete canopy were fortunately roped off and when it collapsed – only one of the builder's workmen was injured. The collapse occurred between 11 a.m. and noon, had this happened two weeks later when the opening had taken place the pavement area would have been filled with Christmas shoppers with possibilty fatal crush injuries. A steel framed canopy was hastily erected for the official opening which took place on a Saturday morning. I was on Eastgate Traffic Patrol Area from 10 a.m. on the 5th Oct but did not witness the fall of the canopy as at that time I was in Paris Street taking a statement from a witness to a traffic accident, when I returned to my patrol area I found utter confusion following the canopy collapse. The remaining section of the canopy on the the Northernhay Place side of the building had be knocked down with pneumatic drills. I still have my Police Note Book for that date so can I can authenticate the date." Syd Rowsell, ex Exeter City Police. Photo Trevor Brown. 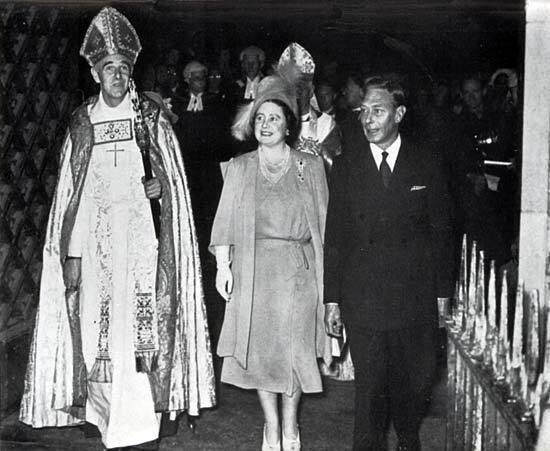 The King and Queen, left, with the Bishop of Exeter the Rev., Robert Mortimer on 10th July 1950 leaving the Cathedral. 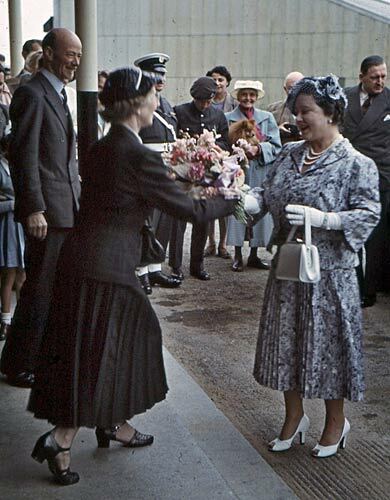 On the right is Queen Elizabeth (later the Queen Mother) being presented with a bouquet of flowers at the terminal of Exeter Airport by Mrs Parkhouse in 1953. Her Majesty had flown into the airport in a Vickers Viking of the Queen's Flight. Photo Lydia Barnard. Mayoralty of Charles Woodland in 1959. 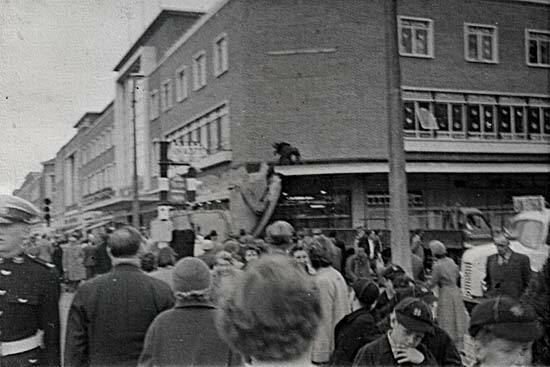 Film of public duties of the Mayor in 1959. Includes a St Loyes fete, and processions to the Cathedral and in St Davids. A short film of Exeter Cathedral in 1950. From BBC footage released under the Creative Archive scheme. 2.8MB WMV file. Okehampton Place suffered a serious flood in 1954. 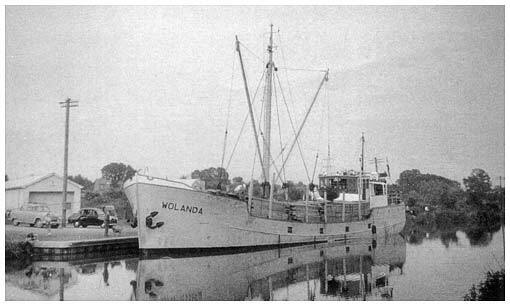 Greenslades Tours were established in 1912. 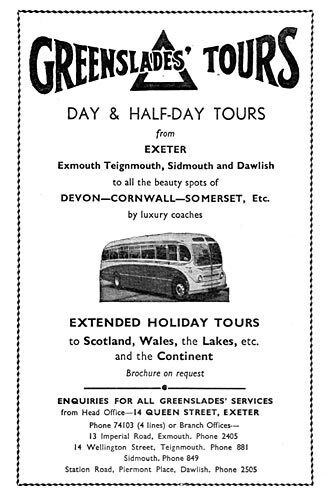 This 1950 leaflet lists a full range of tours from Exeter. A day trip to Bournemouth cost 12/9 (68 pence)and a half day tour of Haytor and Widecombe was 5/6 (28 pence). They also stated that 46 of their drivers obtained the Diploma of the Royal Society for the Prevention of accidents in 1949. They are still trading under the Hookway-Greenslades name. See Tram and Bus photo essay. New The Savoy Cinema was provided with a stage and dressing rooms when it was built in 1936. 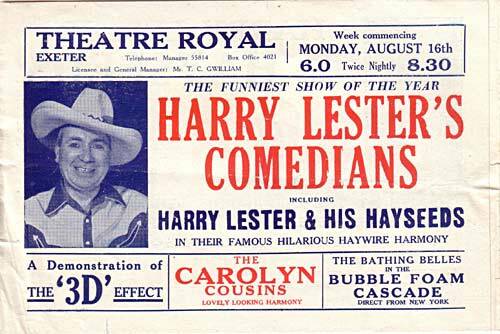 It often had live variety shows in the Forties and Fifties, and in the Sixties it hosted many pop concerts, including the Beatles and Cliff Richard. 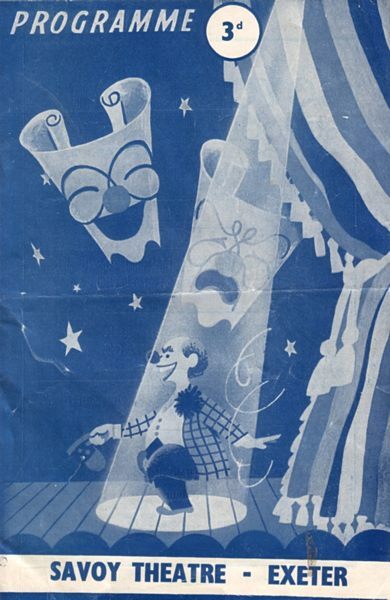 This programme cover from the 1950s is designed to be used for a variety of shows and entertainers. Only the big names, such as Morecambe and Wise and Ken Dodd would have a personalised programme. 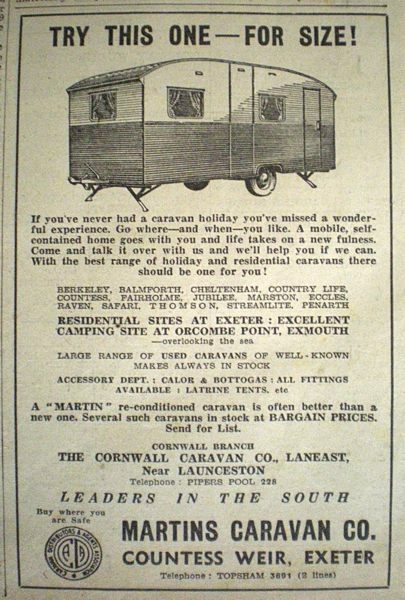 New Martins Caravans was founded by John Belsey Martin, near Clyst St George in 1929. He was Coldplay's Chris Martin's grandfather. The business was sold by his son in 1999 to an employee for £8,825,000, adding £5 million to the family fortune, already acquired from the sale of land around Countess Wear. John Belsey Martin was also Sheriff of Exeter and in 1968, Mayor of Exeter. 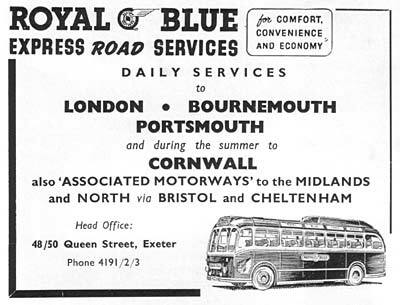 An advert for the Royal Blue Coach Company for long distance services to London - from 1952. 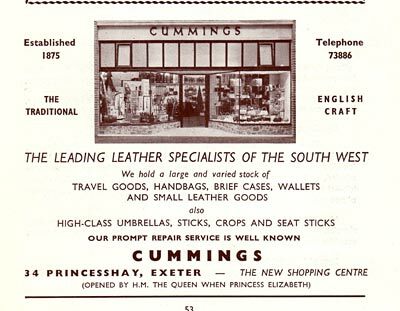 Exeter was an important hub for Royal Blue, who had their head office in Queen Street. See Tram and Bus photo essay. 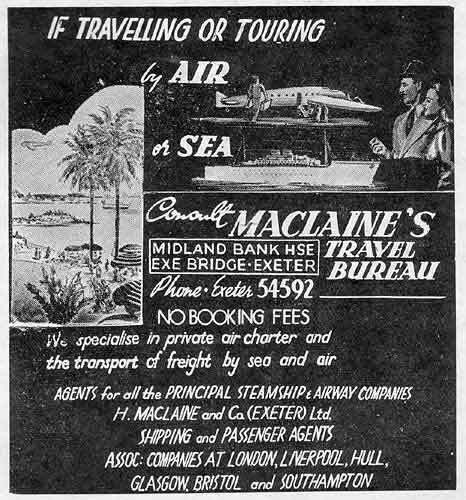 An advert from 1954 for Maclaines Travel. The advert makes travel seem very special and the destination exotic. Almost 10 years after the war, and some are becoming wealthy enough to travel. In 1956, three Spitfires of CAACU based at Exeter Airport, a civilian anti-aircraft training unit working for the MOD, were used in the filming of the British war movie, Reach for the Sky starring Kenneth More. An experimental scheme where a policeman stood on a raised platform in the centre of the Countess Wear roundabout so that he could watch the traffic flow and manually control the four sets of temporary traffic lights was introduced. It was hoped that holiday traffic flow on the Exeter By Pass would be improved. Times August 1959. In 1952 Exeter Airport Ltd attracted the first post-war civil airline, Jersey Airlines, who were followed by British Westpoint Airlines, Mayflower Air Services, South West Aviation, and Morton Air Services. 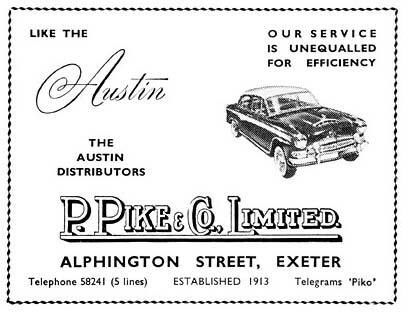 P Pike and Co survived the war and are still promoting a rather more modern Austin in 1952. By 1958, the car was more modern but the style of the advert stayed the same. Growing prosperity and the influence of American car design is showing for the first time. 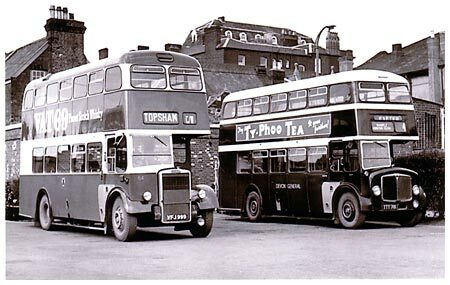 A Devon General and an Exeter Corporation bus parked in the Paul Street bus station circa 1959. Rougemont Hotel is behind. Harlequins and Habitat now occupy the land. See Tram and Bus photo essay. 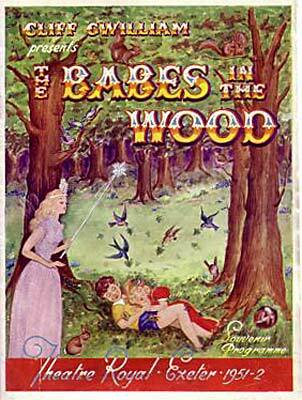 The Theatre Royal started the 1950's after the austere 40's with a high standard of pantomime. These two colourful programmes are from 1950 and 1951. 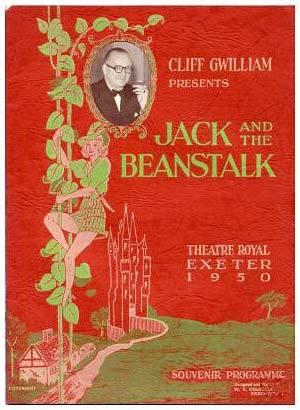 The Theatre Royal panto's were the high point of the winter for many in Exeter and Devon. 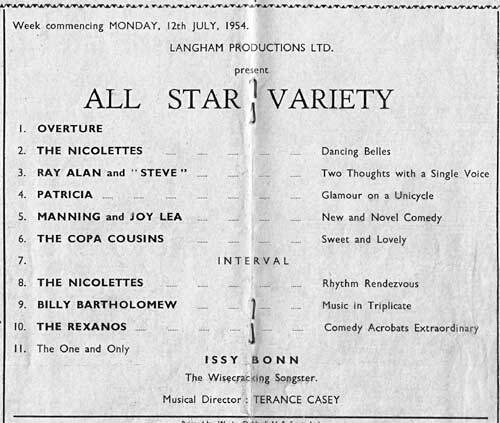 A programme for the summer of 1954 for the Theatre Royal. 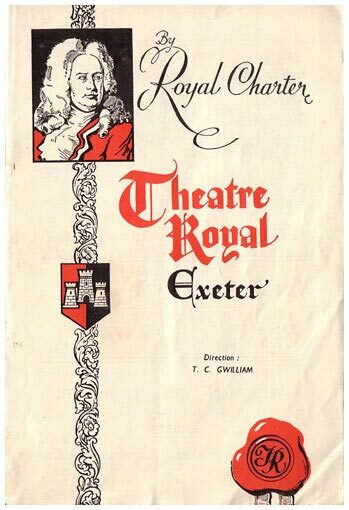 The general variety show called Royal Charter had dancing, singing and comedy routines. 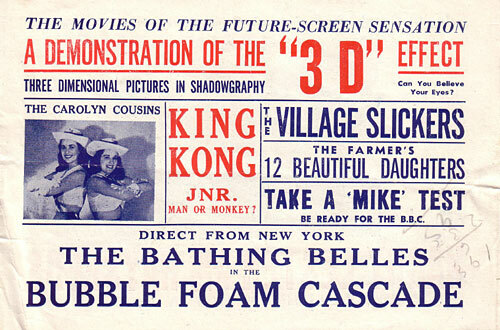 The two flyers advertise a 3D film presentation and other attractions. The Imperial Hotel was built in 1810 as the private Elmfield House. In 1950 the weekly tariff was 7 gns (£7 35p) It is no longer an hotel, and is now part of the Wetherspoon's empire - from 1952. 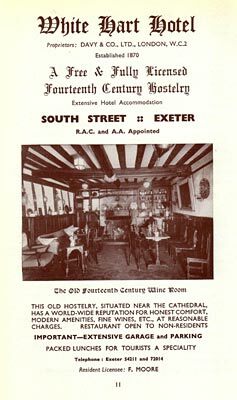 An advert from 1958 for the White Hart Hotel - South Street The inn is one of the oldest in Exeter and was founded by William Wynard. It was originally known as the Blue Boar Inn. 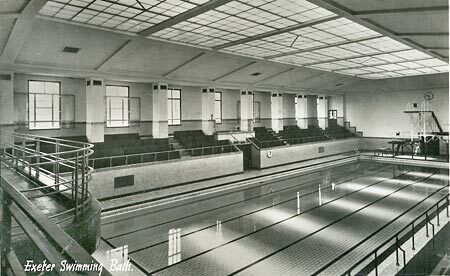 Exeter's Swimming Baths 1953 before they were renamed the Pyramids. Built in 1939, they were used as a water tank duing the blitz. It is planned that they are to be replaced by a new pool at Clifton Hill in 2010. In 1957, the Daily Sketch offered the Fountain Inn on the quay as a prize in a competition. 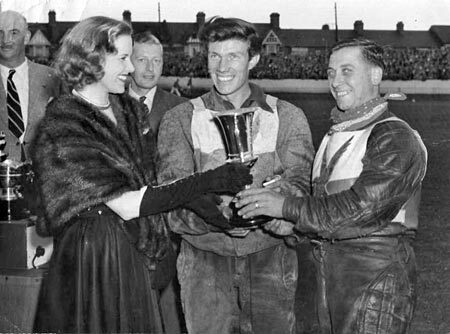 Renamed the Prospect Inn , the prize-winners, Frank and Alma Ward from Hull went on, during their time running the place, to raise money for the Vranch House School and the Devon & Exeter Spastics Society. Sun Street - in 1958, there was only one building in Sun Street before the area was rebuilt after the blitz. In the centre of the bomb site was a Nissen hut, used by Social Services. When John Portley started his jazz band, the Crescent City Stompers, they performed once a week in this small hut, which was always packed to about four times capacity! Later the band moved down to Buller Hall in Cowick Street and then to the Civic Hall as its popularity grew. Portley went on to open the Quay Club, now known as Tiffany's and Mambos. 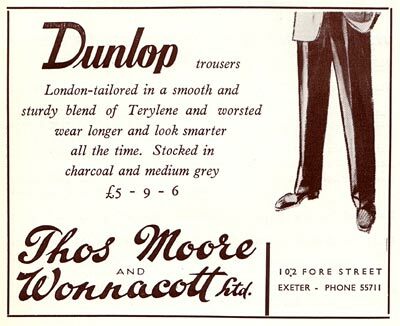 A stylish advert for Thomas Moore in 1958. In 1952, Edward Walters and Ralph Alford took over the business and purchased the credit traders, Wonnacotts. They dropped Wonnacott from the name at the end of the 1950's. Cummings in Princesshay The advert from Cummings dates from 1958 - they were one of the original businesses in Princesshay. The colour photo was taken just before they vacated the Princesshay premises in 2004, prior to the redevelopment. 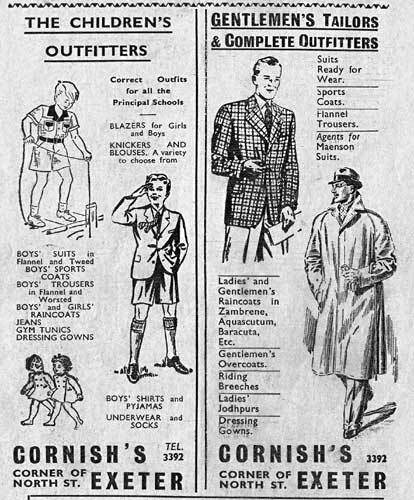 A favourite outfitters with Exonians in 1954 was Cornish's. This is two adverts on opposite pages from the Theatre Royal programme. They still promote school clothing, but have added scouts outfits and jeans to their range. Adults can buy their riding breeches and jodhpurs from the same store. 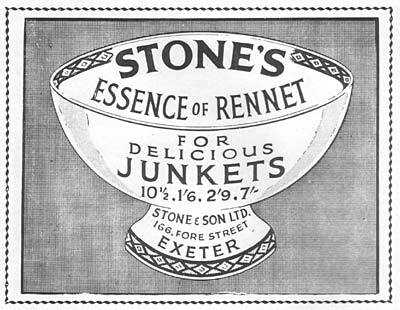 An advert for Stone's Rennet- from an era when housewives spent hours preparing meals for their hungry families! Stone's started by making a beeswax furniture cream - this advert is from 1952. 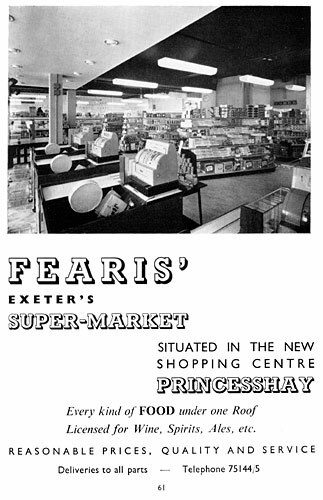 By 1958 the supermarket has arrived in Exeter - Fearis' occupied the old Co-op building near Eastgate. Remember the speed of the check out girls' keying in the prices - no bar codes then. 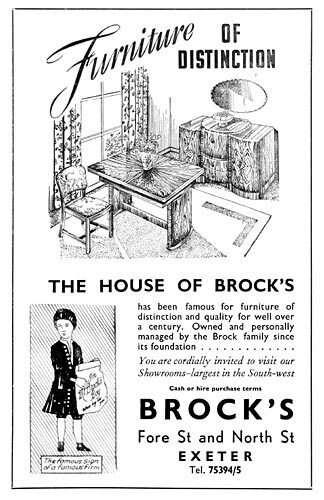 Brock's have survived two world wars and are still trading. Rationing was coming to an end and utility furniture was being replaced by furniture with (left) 'dignity and charm' - from 1952. 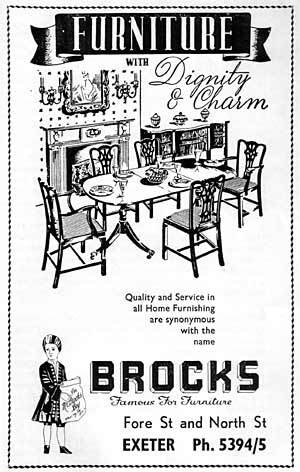 Changes in furniture fashion are shown in the illustration in the advert - from 1958 (right). 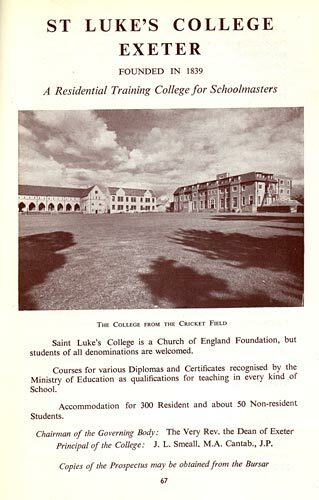 St Luke's College advert left, in 1958, had not yet been absorbed by the University. The old 19th century buildings had been badly damaged by the May 1942 blitz (bottom circa 1950). Founded in 1839, the college offered Physical Education, Mathematics and Science Diplomas. See Swansborough photo essay for more photographs of bomb damaged St Luke's. 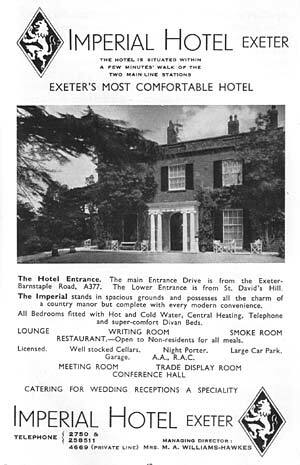 Exeter University received its Royal Charter in 1955. The Queen handed the charter over at a ceremony during her visit to the west country. 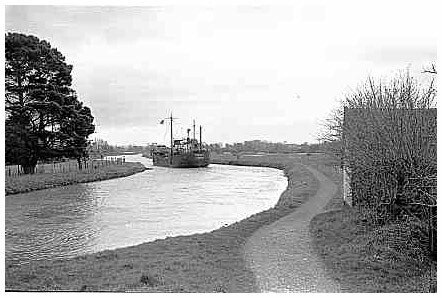 Heles Grammar School moved from its Heles Road site to Southam Farm, Quarry Lane in 1959. It later became St Peter's C of E High School. In 1955, Cleve House was opened as a centre for the training of Guide Dogs for the Blind. Princess Alexandra was shown around the centre, given a display of guide dogs by their owners, and was presented with a golden labrador puppy. In 1953, St Luke's College School moved from its old site at St Luke's College to a new site at Ringswell Avenue and was renamed the Vincent Thompson High School.